ATN NVBNB05XC0 NVB5X-CGT Night Vision Binocular FREE SHIPPING! Enemy targets will no longer be able to hide in the shadows or behind cloaks of darkness while using the NVB5X-CGT Night Vision Binocular from ATN. 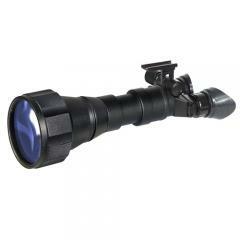 Featuring the latest innovations in light processing technology and an impressive 5x magnifier, the NVB 5X-CGT offers the long-range night vision functionality required by tactical and military professionals. All glass multi-coated lenses and a powerful internal image intensifier work together to utilize both visible and non-visible light rays to deliver clear and easy-to-read sight pictures. When no light is available, a long-range infrared illuminator supplies the light needed to ensure vision clarity. Automatic brightness controls adjust images based on ambient light, ensuring users always have clear visibility regardless of external field conditions. An auto-off feature protects both users and equipment by shutting down the image intensifiers when too much ambient and peripheral light are present. The binocular boasts a tough, ruggedized construction that is both fog and water-resistant in order to meet the demands of rigorous tactical applications. ©2002-2019 CopsPlus.com: ATN NVBNB05XC0 NVB5X-CGT Night Vision Binocular FREE SHIPPING!